Thunderstorms raced through the Houston area Thursday, aggravating flooding in already drenched parts of the city as mandatory evacuations were ordered for low-lying neighborhoods in a community about 50 miles away. 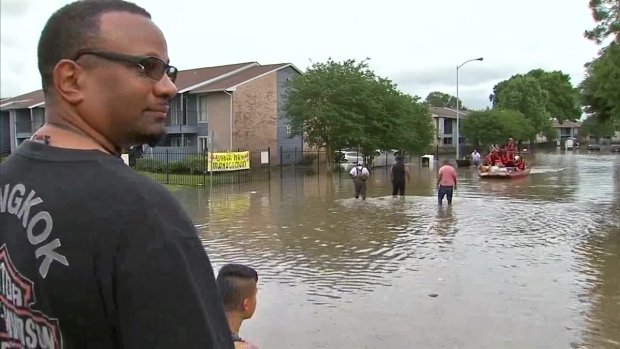 Houston and surrounding counties have received more than a foot of rain since Sunday night, and the flooding has forced thousands of people from their homes as creeks and bayous became overwhelmed. At least eight deaths have been blamed on the weather. A heavy rainstorm Thursday morning dumped more than an inch of rain in less than an hour in some areas of Harris County, which includes most of Houston. Torrential rains bring landmark flooding to Houston. "We're seeing some minor rises in some creeks," Jeff Lindner, with the Harris County Flood Control District, said. "It doesn't look like we'll see enough rain to see more widespread flooding." Water likely would collect in some streets but subside once the rain stopped, he said. Two aging reservoirs in west Houston considered "extremely high risk" by the U.S. Army Corps of Engineers were holding record amounts of water -- at 50 percent capacity -- but remained in good shape, he said. Meanwhile, officials in Wharton, a community of about 8,700 residents about 50 miles southwest of Houston, ordered residents to leave their homes in some low-lying neighborhoods along the rain-swollen Colorado River. The river's flood stage is 39 feet but the river level there exceeded 47 feet Thursday and some streets were underwater. Mayor Domingo Montalvo Jr. expanded his order later Thursday to include about a square mile of town, affecting some 350 homes. "The water's coming up a little faster than we expected," he said. Police Chief Terry Lynch said most residents had complied and about 30 were rescued, but a handful refused to leave their property. "We're not going to forcibly remove them from home but we're strongly encouraging them to leave," he said. Flood warnings remained in effect for several southeastern Texas counties. Forecasts showed the conditions were expected to improve starting Friday.